OMG I LOVED THIS BOOK!!!!!!! First I fangirled over the Boys from Starships Around Saturn and Now I am in love with a group of Hooligans! What happens when you think you meet someone amazing and when you go to find him he is gone? Well duh, you jump in the car and go on a ROAD TRIP with your BFF to chase your forever down. Haley gets swept away by a handsome strange that seems to understand how she is feeling but when he fails to show up the next day leaving only a paper star, Haley and her BFF Linzi jump in the car and go to fine the handsome strange, only to wind up in Crescent Cove California and realizing that her forever may not have been what she thought. Meeting an amazing group of friends and maybe even finding a little bit about herself. Her chase for forever turns out to be a LOT more. The boys? OMG, my boys!!! (YES, MY BOYS) Reed, A.J. Vin, Alston and the rest of the West Coast Hooligans!!! I absolutely loved them. Each one had such a great personality and really made me fall in love with them and want to be a part of their world (I’m now want to move to Crescent Cove). By far REED was my favorite something about how sweet he was and how easy it was to talk to him (not that I personally had conversations with him, at least not out loud when anyone was home, I’m just kidding, maybe) Nikki has an amazing way of writing (I’m about to fangirl again and I am seriously trying to contain myself) it is so real, as if it’s just a group of friends just hanging and having a conversation. It makes it hard to put down and I really could not stop reading this book. LOVED IT!!! I loved following along on this adventure and seeing Haley chase her forever . I honestly didn’t think I was going to cry but all it took was a Wizard of Oz reference. 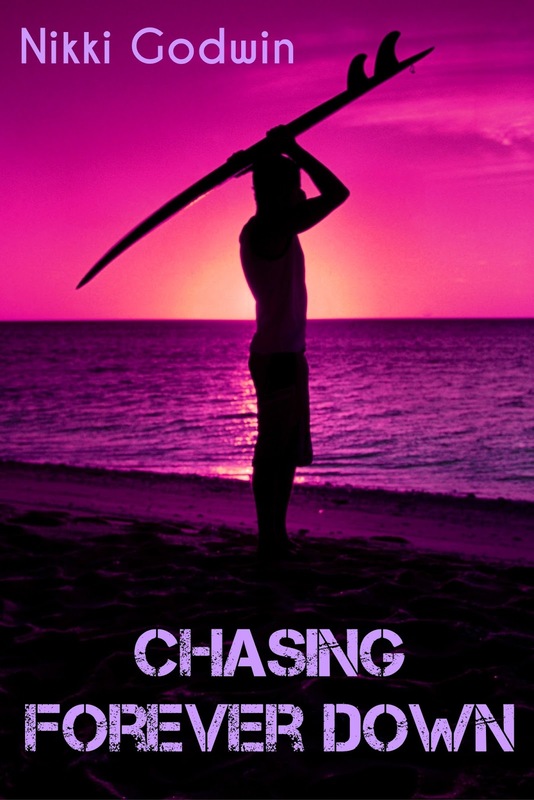 I gave Chasing Forever Down 5 stars, I think this is a fantastic read with very strong characters and a story that really makes you want to drop everything and chase your forever down. I adore Nikki and I love her writing style (so natural) and how she creates a wonderful world with characters that you want to spend so much more time with. I want to know more about the West Coast Hooligans and everyone from Crescent Cove (book #2 please). I was not disappointed (with Nikki I never am) and I recommend this 100%, I guarantee you will not be disappointed either, I cried Damn it, I never cry!!!! I look back. His lips keep moving, but I can’t hear anything over the roaring of A.J.’s jet ski. “– the hell! ?” is all I catch. I throw my arms into the air and shake my head as Alston moves toward me. “What the hell are you doing?” he asks once he’s within earshot. He motions at A.J., but I know he’s talking to me. My blood boils as hot as this raging summer sun. This whole jet skiing with A.J. deal was a ploy, just like I thought. He’s probably rocked his mechanical bull moves on that yellow jet ski for a thousand girls. I bet he blew cigarette smoke on them and wrapped his arm around their pretty tan shoulders and told them how wave jumping with him would be the most badass experience of their lives. And at that point, the girls decided to take turns riding with Alston or they found another chiseled beach bum to waste their time with. None of them ever dared to get on the back of Jailbird Gonzalez’s jet ski. 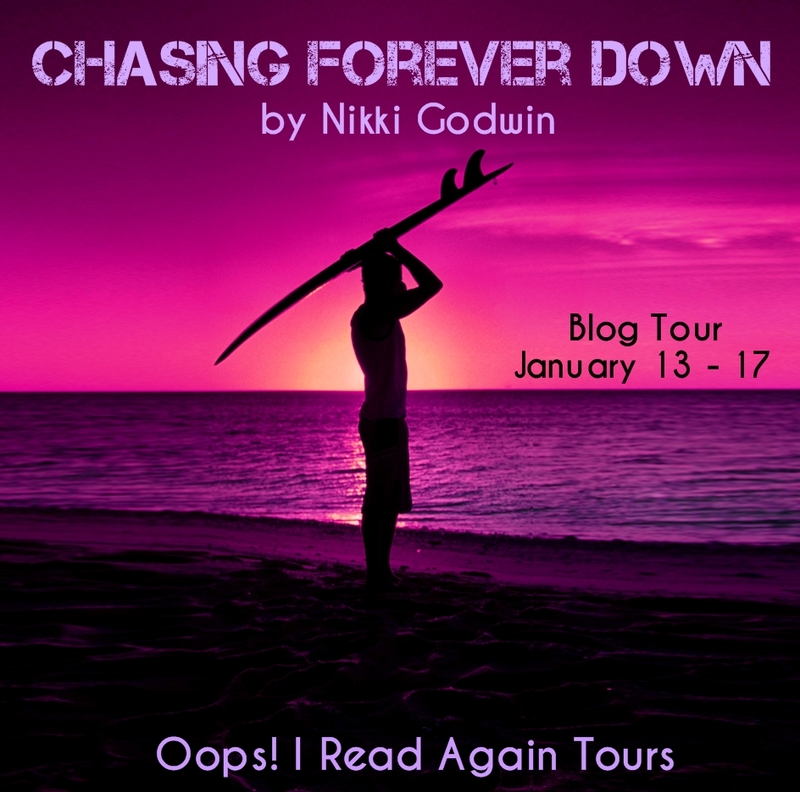 Nikki Godwin is a Young Adult/New Adult author from the southern USA. She is a city girl who can’t live without Mountain Dew, black eyeliner, Hawthorne Heights, and candles from Bath & Body Works. When not writing, she’s not-so-secretly internet-stalking her favorite bands. She may or may not completely love One Direction. Websites and More ~ Task It Tuesday! I didn’t peg this book as a tear-jerker! hmm I may need to move it up my tbr! I do love the road trip aspect and who doesn’t love CA surfer boys? As soon as she got to A.J. I was like, OMG I'm going to lose it lol. Thanks for the chance to read it. Can't wait to read more about.